Tanner Baker was the third commitment to play for the BYU football team (Class of 2017). 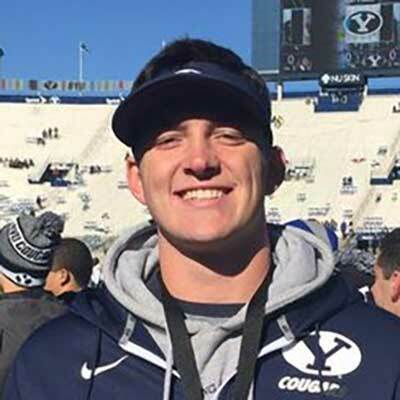 Baker is a 6’5” 230 pound tight end/defensive that prepped at Moorpark (CA) High School, where he was teammates and friends with another BYU recruit–Bentley Hanshaw. As a junior Baker had 33 tackles, seven sacks, and one TD. He was used primarily as a blocking tight end on offense. He also played on the basketball and track teams, and was an All-Coastal Canyon League honorable mention last season in basketball. He has moved with his family to Georgia, and competed for Allatoona High School as a senior. Baker was rated 2-stars by Scout, and was not rated by Rivals or ESPN. Baker received scholarship offers from Ball State, BYU, Elon, Navy, Southern Utah, and Tennessee Tech, and he was also recruited by Utah State, Virginia, and Wake Forest. Class: 2017 HT/WT: 6’5”, 230 lbs. Tanner Baker is a recruit for the BYU Class of 2017. For a comprehensive list of all of BYU’s c/o ’17 recruits and commitments click here. If you have any additional information or insight about this recruit, please include it in the comment section below.